Eagle Ridge…now an even better place to play! Whilst many golfers have been in winter mode and not generally venturing out as much onto the fairways, or for those lucky ones who have been on tour to warmer climates, our golf course team have been working hard to improve the playability and general enjoyment of the golf course. No one likes straying into heavy scrub off the tee and the fun tends to fall away when you can barely find a way into where your ball has ventured. Whilst we all know it’s the balls fault that it ended up there! This was indeed the case from the tee at the 15th hole. 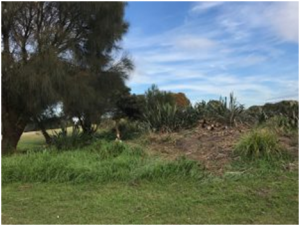 It’s bad enough to have the boundary line on the left-hand side along the natural wetland area, but to also have the right-hand side ball graveyard that grew from a small flax plantation into a major hazard was just too much! Indeed, contrary to our goal at Eagle Ridge of being a challenging but fun place to play golf. Something had to be done! (See before and after shots). 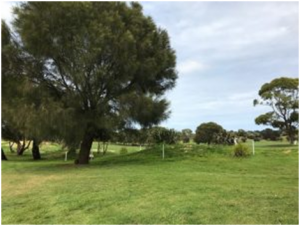 So now if by some slim chance your ball heads slightly off course from the 15th tee you will generally be able to find it, hit it and move on. Whilst we think we’ve done a good job, we realise there is more to do along that side proceeding towards the green and these areas will also be improved in time, but the main landing zones are now definitely more ball friendly… and that has to be a good thing. We are blessed with our little patch of paradise to have a far-reaching sand base to work with but mother nature has a way of fighting back. 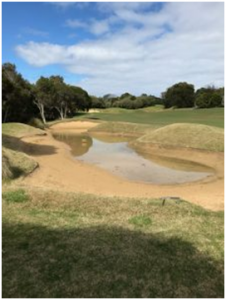 With the natural wetland area along our 15th and 16th fairways comes a low-lying water table that in the height of any wet winter can flood some low lying bunkers. We will soon be raising 2 of these bunkers to hopefully keep our feet and ball dry and we’ll see how this works over the next winter period. This is another small improvement that will be completed by the end of November in our ongoing efforts to help you enjoy your total Eagle Ridge golf experience and maybe help you knock a couple off your handicap. Another project that we have just completed is the construction of a viewing deck near the new back tee of the 2nd hole. Take the steps to the brand new 2nd blue tee area, now expanded for many more tee options along with a great open outlook. The new landscaped deck area showcases our golf course, clubhouse and lakes in the foreground with the hinterland and Arthurs Seat as the backdrop. Ahh the serenity! So to all our golfers, come see and enjoy these improvements to our Golf Course, Eagle Ridge… the place to play!